A baby seal was rescued from the side of a New Hampshire road after Friday's nor'easter left it stranded there. A baby seal who had lost its way was rescued Monday morning from the side of Route 286 in Seabrook, New Hampshire. Just before 7 a.m., Seabrook police reported the stranded sea pup and called nearby Seacoast Science Center Marine Mammal Rescue for help. "That, of course, was an emergency situation for us," said mammal rescue manager Ashley Stokes. "That road gets very busy for us in the morning." The animal welfare organization responded to the scene, taking the seal, which appears to be about 2 months old, to the National Marine Life Center for rehabilitation. Stokes described the seal as "an animal that had not quite grasped life on its own yet," saying it was newly separated from its mother. The seal was in bad condition, described in a Facebook post by SSC Marine Mammal Rescue as thin, lethargic and showing signs of internal bleeding. The organization described the seal's prognosis as "extremely guarded and unknown," but noted that the seal is at least out of harm's way just before Wednesday's predicted storm. 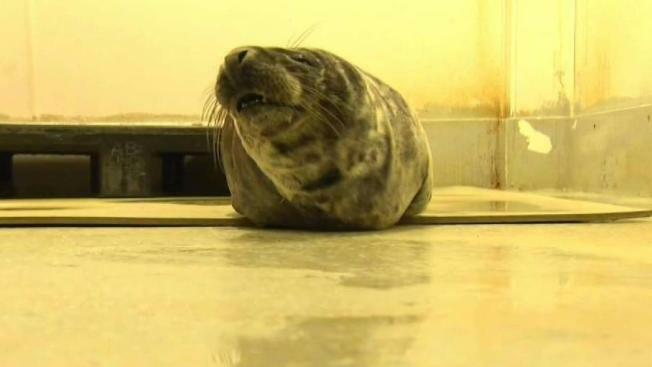 On Wednesday the Seacoast Science Center said over twitter that the seal, named Saco, was in much better condition. "this condition is still guarded," wrote the organization, "but he already looks better than he did 48 hours ago." "He was brought to us dehydrated and lethargic," animal care assistant Wendy Wyman said. "We gave him IV fluids and we start them out with pedialyte." As soon as the seal is eating normally, marine officials say he'll be released back into the wild. The organization said it will continue to post updates on the animal's progress.